I'm in the throes of revising this page in part because muskrats keep surprising me. 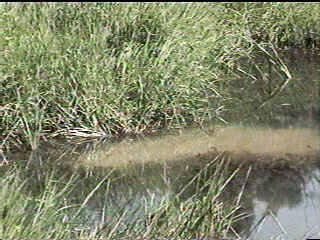 Minks stalk and kill muskrats, yet, the other day, as the video clip below shows, I saw a muskrat chase a mink away from a pond. So, yes, muskrats are relatively small, not much bigger than a cat, and they are avid eaters of green grass, not meat, but they are tough little animals just as likely to stand their ground and even attack than run and hide. I've spent a lot of time with muskrats, and the curious thing is, I never quite get a photo of them that I think captures the real muskrat. 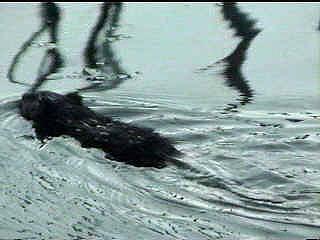 The Indians called them muskquoshes which, I think makes more sense because muskrat gets you thinking about rats, and muskrats are more than big swimming rats with long tails even though that is what they look like. 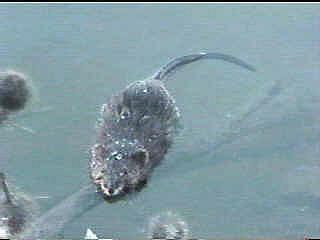 To begin to understand them, I think it best not to emphasize the "rat" in muskrat. They are rather outdoorsy and when the sun shines on them especially in the winter, they are a splash of beautiful color. Unlike the verminous rat, the muskrat seldom invades our space. 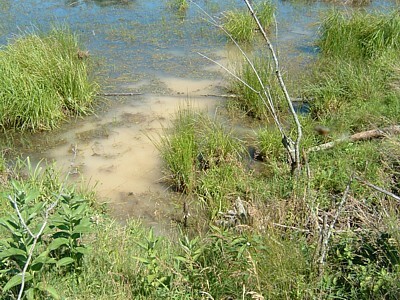 It is seldom far from water, and usually marshy wetlands at that. 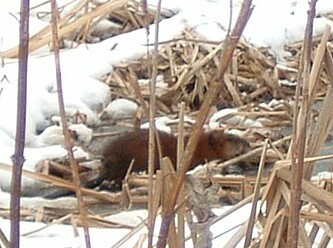 Again, unlike a rat, the muskrat makes its presence known. 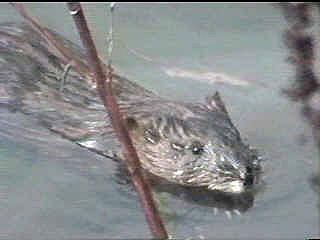 Like the beaver, it can den in a lodge in the middle or along the shore of ponds, shimmering in the damp. These lodges, also called push-ups or mounds, are not as grand as beaver lodges. 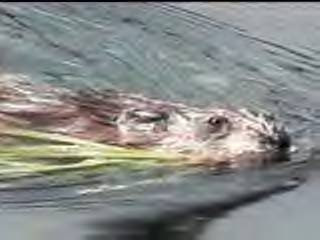 The muskrat does not haul in logs and slap on mud. It fashions the mounds out of grasses, reeds, and perhaps a few small sticks into a mound a few feet high. Sometimes they build the mounds around trunks of dead bushes. That brown blur in front of the uplifted mound is a muskrat swimming by. 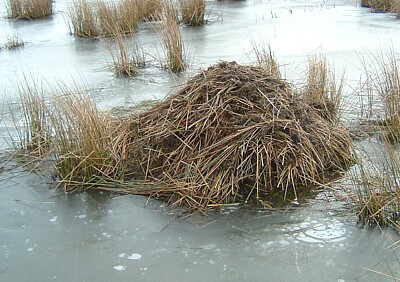 Muskrat mounds are smaller than beaver lodges, but usually more symmetrical and because of that can strike one as being more beautiful. I had an especially pleasant evening one winter walking around on the pond ice to see the 13 snow covered muskrat mounds around the edge of the pond. At the time I fancied that these were the results of years of building, but within two years they were all gone, probably taken apart by muskrats. 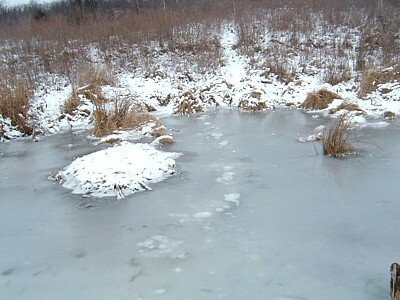 The mounds primarily serve the muskrats as homes in the winter. 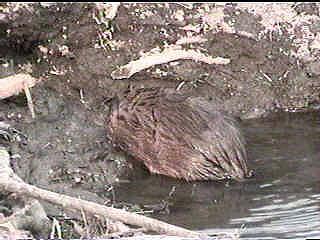 The rest of the year they seem to prefer beaver lodges or boat houses along the river, and burrows into the banks of ponds. 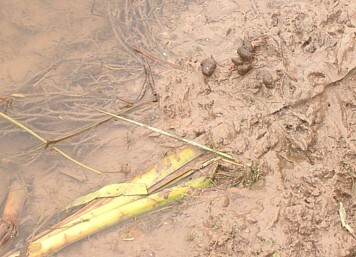 (There's a little muskrat poop outside the burrow above.) 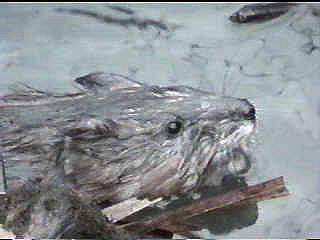 Like all rodents, muskrats are adept at tunneling into the earth. 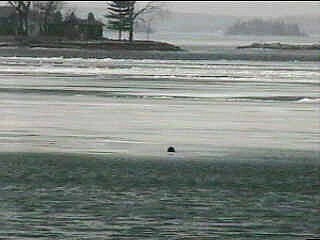 This is not to suggest that muskrats don't also use their burrows along the shore in the winter, too. I love to see their trail of bubbles under the ice that lead me to their current dens. Intriguing as muskrat constructions can be, they don't rival beavers as engineers. 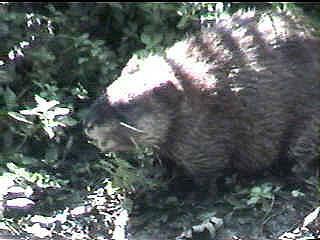 Indeed I've seen many a muskrat live quite happily in a beaver lodge occupied by a colony of six beavers. I've often seen muskrats carrying in grass for the babies at the time of evening when the beavers holed up in the lodge go out to look for trees to cut down. 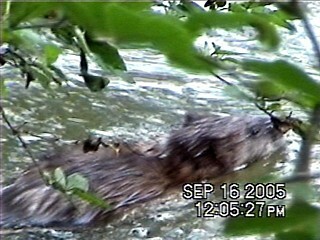 Then as it grew darker the beavers would come out and start moving their big branches around. 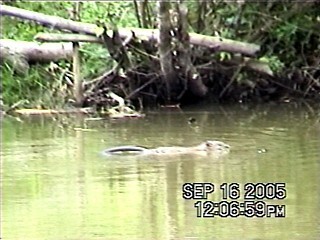 One night a beaver surfaced with a stick just as the muskrat swam by: the latter dove in a panic. 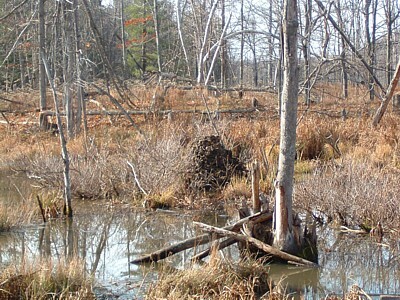 This coexistence continued for a few weeks, and then only the beavers remained. 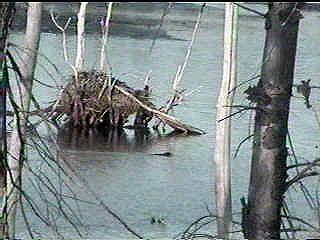 I think it is possible for beavers and muskrats to share a lodge during the winter. 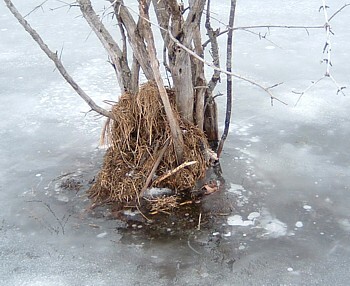 In preparation for winter beavers usually sink tree branches in the pond around the lodge, storing food for the winter. In a pond where two small muskrats shared a lodge and a system of burrows in the pond bank with two beavers, I saw a muskrat come out, and just as beavers often do, take a twig from the cache collected by the beavers and carry it back into the lodge to eat. though I think the shapely harvesting was also done by muskrats. delicate, more often stalks than twigs. 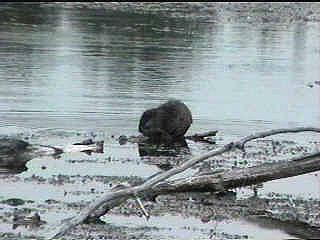 Of course, muskrats do come out of the pond to eat though I've never seen them more than a few yards from a pond. 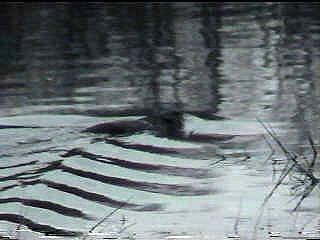 Muskrats are nothing but patient and persistent. They are nibblers, though that should be qualified: they are nibblers whose mouths, with rather big front teeth for such a small animal, can go a mile a minute. You can't see the mouth but you can sense how fast it is moving by the tight ring of ripples coming from the bite. The other end of the animal is geared the same way. 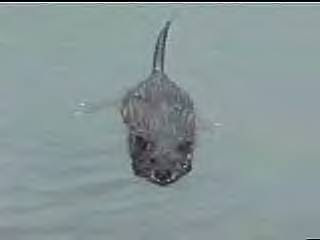 Its straight tail is smaller and does not appear as powerful as a beaver's or otter's tail. I almost wrote that their tail is small, which is true when compared to the tails of bigger animals like beavers and otters that are several times the size of muskrats, but in proportion to the animal's size, a muskrat's tail is no slouch. When it rotates rapidly, the ripples forming a wake show its power. 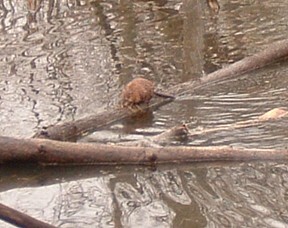 A muskrat can use its powerful tail for effect when it dives. 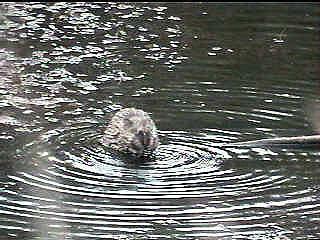 Like the beaver it is not adverse to making a startling noise when it dives. 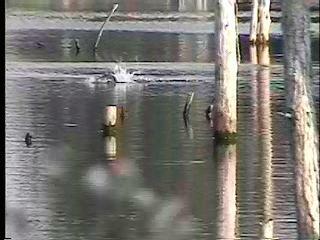 However, I should add that the splashing I captured above was done for the benefit of another muskrat. 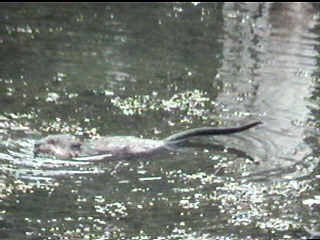 There was another muskrat in the water, and they both began showing off, scooting forward so fast that they left an an arch of water in the air like a jet ski! This was well after mating season, so I suppose it was a form of playing. It didn't seem to be a case of defending territory. 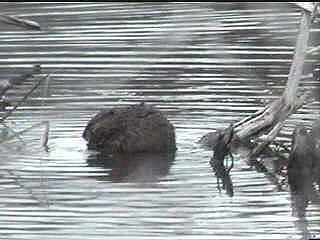 The video clip below shows a muskrat defending its share of a big beaver pond. 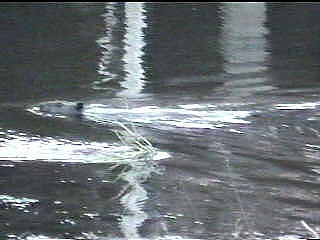 I was 50 yards from the splashing muskrat, and generally muskrats don't deign to notice you at that distance. You can get fairly close to muskrats, say within 20 or 30 yards, before they take umbrage, and if they don't dive with a snap of the tail they usually glare at you as they hurry by swimming right below you on the way to their burrow. 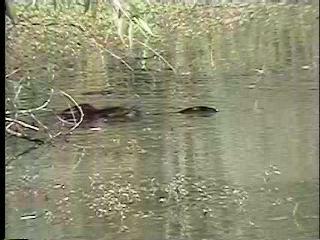 Below the next photos is a short video clip I took of muskrats. 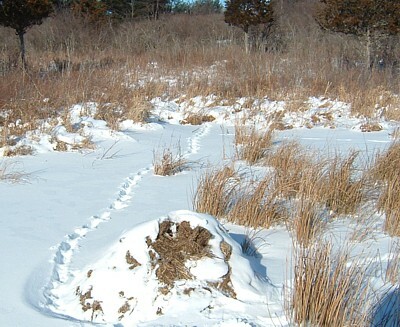 Like most smaller mammals, muskrats are hard to track. At times they can seem to be all over a beaver pond, but then when you begin to rely on them for companionship, especially when the resident beavers decide to come out only when it is dark, they are no where to be found. Part of the riddle is that because they are so prolific with large litters of six babies and possibly two litters a year, as a species they are practiced in dispersal. 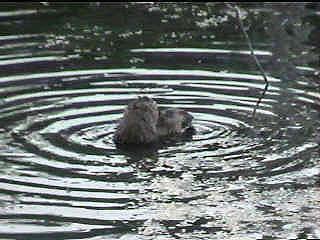 So while a beaver might stay in the same pond for a few years, muskrats are usually on the move after each litter is raised. Yet, though I dare say they live more adventurous lives than a beaver, they can seem rather boring at times, just a small ball in the corner of a pond nibbling away. 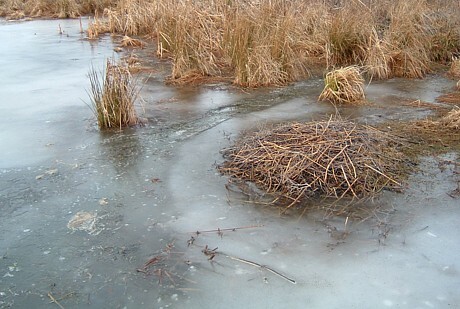 One spring I saw three of them balled up sharing the thawing ice with geese looking for places to nest. 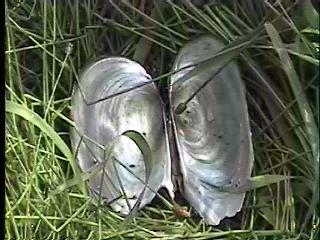 Or they can be seen during the winter balled up on the edge of the river ice, surprising you with the green things they find under water. But sometimes they can put their lives right out on the line for you to see. In late spring they seem to have a compulsion to mark every floating log in their territory. Needless to say this concern about territory can lead to fights, or at least to some strange music. 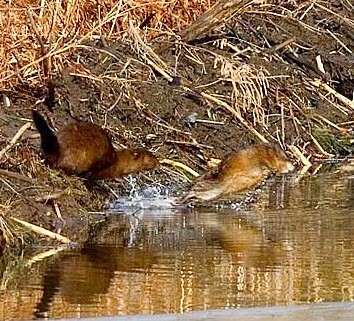 Muskrats make an eerie whistling sound when they are stalking each other. I once saw two pairs of muskrats go at it. Their encounters were brief, with much splashing, and the apparent loser did not move off very far, only far enough to recoup for another fight. And then all the animals seemed to go about their business much as before, though probably with newly understood boundary lines that I couldn't perceive. 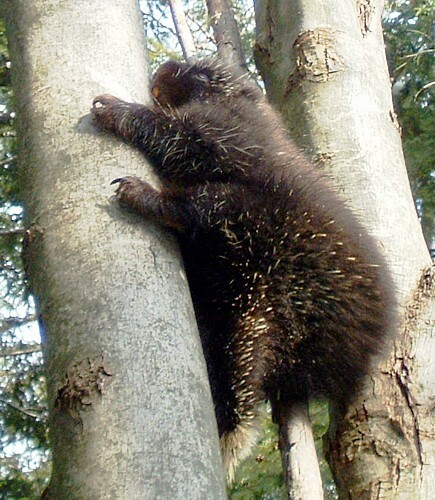 When the babies are growing up, they can be quite affectionate with their mothers, trying to climb on their backs. But I must admit, this type of activity is hard to see. 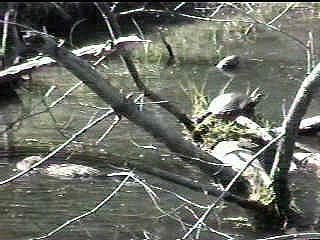 In late spring of 1997, I saw five baby muskrats grazing in the bright green grass on an old dam of a small pond. Every time a bird flew over they would hurl themselves back to their den in an old beaver lodge a few yards away. Then a few minutes later they would swim back to the lush green grass. I didn't have a camcorder then and every May since, camera ready, I've searched and waited for the same scene in vain. so beautiful they should be able to keep it. Because they are so widely trapped and have been persecuted for centuries, statements about how they fit into the broad scheme of things have to be view with skepticism. 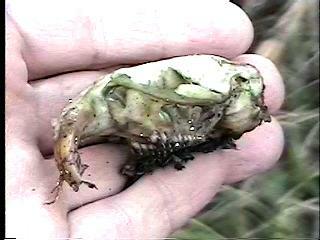 The two kinds of carcasses I find with the most frequency in the swamps are deer and muskrat. 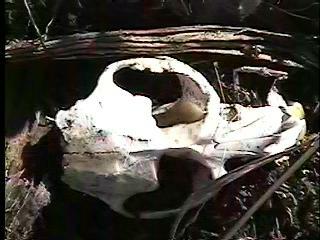 Here are two views of muskrat skulls I found in the swamps. A goodly portion of the deer were killed by humans. 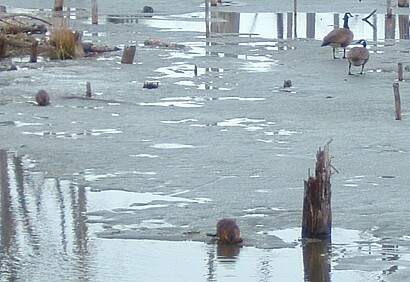 The muskrats succumbed to natural predators or disease. 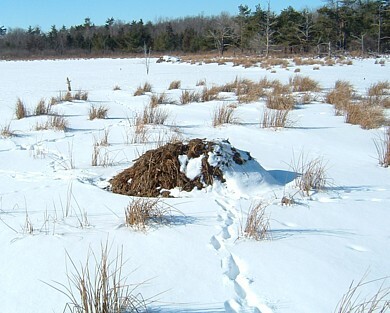 Yet before I credit muskrats for feeding predators like mink, coyotes, or large birds, as well as the many scavengers in the swamps, I must add that I often find dead muskrats untouched by scavengers while a dead deer, save when it's frozen, is rapidly utilized. 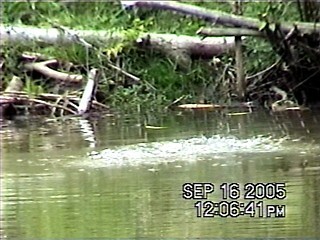 Mink are said to be the principal muskrat predators. 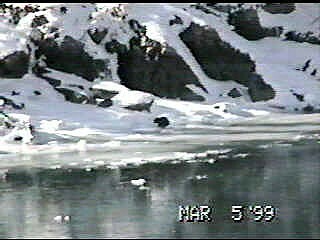 But the one time I saw a mink attack a muskrat, the muskrat got away, and even came back to somewhat tentatively taunt the mink. 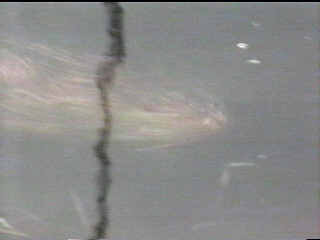 Below the photo below is a Google Video clip of a mink attack, and remember, the muskrat survived and the mink left the pond. My friend Jeff Hanna took the photo while I was handling the camcorder. 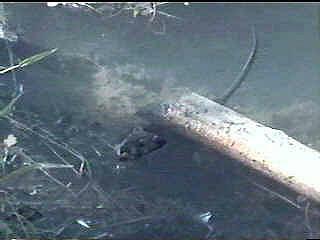 and into a indentation or hole in the lodge half foot out of the water. Then I heard a noise just to my left and I saw two balls of fur up on some twigs that cover the entrance to one of the many burrows. 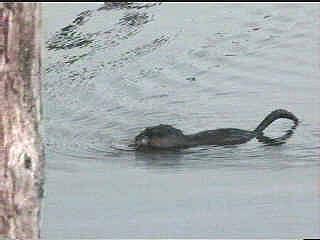 They jumped into the water and two adult muskrats swam in tight circles and splashed the water. 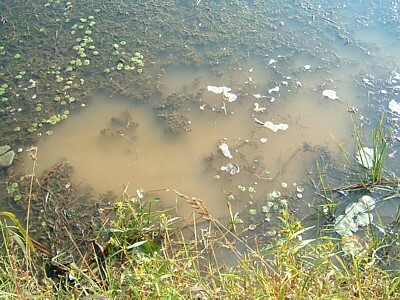 no doubt prepared to drive the mink away if it came close to the pond. As far as I could tell the muskrats didn't dive into the lodge, but into burrows on either side of it. Then I saw a muskrat swimming over to the lodge from the far corner of the pond, as fast and as menacingly as a muskrat can, which is to say it left a deep wake for such a little animal. It dove into the burrows by the lodge, and then a baby muskrat swam out of the burrow where the original commotion had been, and swam over to a burrow a little further to my left. 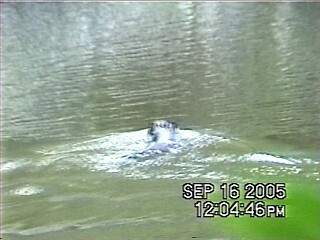 Then an adult surfaced in front of the lodge and swam around the far shore of the pond. 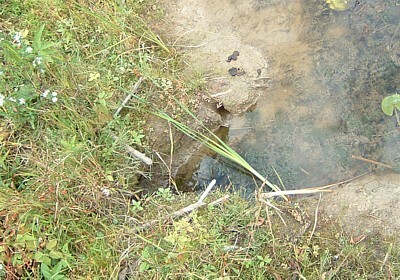 In late winter I saw evidence of both muskrats and a mink in this pond. 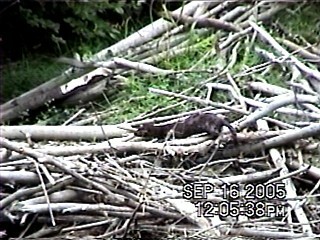 The mink seemed to have two dens, just above the inlet and up in the first rim of rocks. I do not doubt that mink kill muskrats, but what I just saw demonstrated that muskrats who work together and show the grit can make a mink move on. which in turn makes beaver ponds such wonders of diversity. But what of the muskrat itself? What's a muskrat all about? 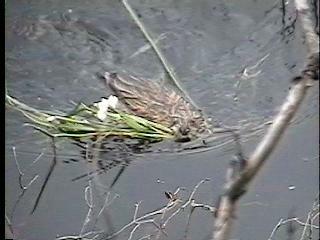 For me a muskrat demonstrates how eternal spring can be. It shows me the way to green life no matter how dark the winter season. Of course it must briefly go where I dare not follow into the cold dark waters of the frozen pond, but what it brings up so often startles with still green life. Our eyes too often stop at the water's edge. The muskrat shows us the richer palette of life's colors that exists a few feet this way or that along the shores of innumerable, nameless ponds.